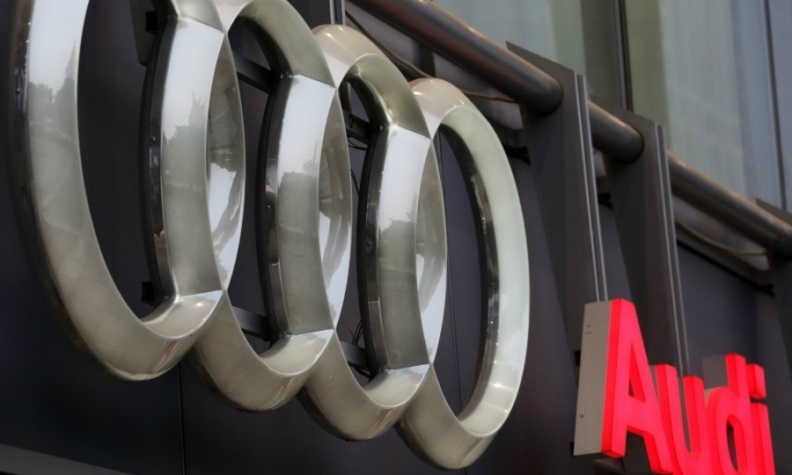 PARIS -- Audi has joined forces with a French biotech company to solve the two big problems that have been holding back biofuels. On a windy morning at a track near Paris this month, the automaker started testing gasoline blended with 34 percent of a biofuel produced from sugar beet waste in one of its A4 sedans. Unlike ethanol, which requires special engines when used in large proportions, the new blend can work in any car engine without modification. As automakers are rushing to develop electric and hybrid vehicles in response to stricter emission rules, biofuel manufacturers are jockeying to find a future in that revolution by touting their crop-based energy as friendlier for the environment than gasoline. The big issue is they must prove large-scale biofuel production won't worsen deforestation, nor use food or animal feeds to avoid criticism that they are jacking up prices and starving the poor. "We're using the non-eatable part of the sugar beet," said Marc Delcourt, Chief Executive Officer of Global Bioenergies, the French company that made the bio gasoline tested by Audi. "No resources must be competing with human food." The biofuel that powered the Audi A4 around the circuit near Paris originated at Global Bioenergies's demo plant in Leuna, Germany, and was converted by the country's Fraunhofer Institute into gasoline additives. The company has 32 patents to develop bacteria which transforms sugar found in corn, beet, wheat straw and wood chips into isobutene, a hydrocarbon usually derived from oil, which ended up in the Audi engine. Global Bioenergies is also working with European chemicals makers Clariant and Ineos Group to extract glucose from wheat straw and convert it into hydrocarbons as it seeks to address the food versus fuel debate that has dogged biofuel makers for years. Clariant's technology is "mature," Delcourt said, without giving details of when this gasoline mix will be commercially available. Car companies including Audi are convinced that electric vehicles won't be enough to quickly reduce emissions, especially in countries where power will continue to largely be produced by burning fossil fuels. They are therefore doing research on engines powered by alternative fuels such as hydrogen, and renewable resources such as agricultural waste. "If we want to stop climate change, we need renewable fuels," Hermann Pengg, who oversees Audi's biofuels research, said at the track near Paris. "Electric vehicles are important to help us cut CO2 emissions, but only if you use green electricity, not if you use coal." How clean electric vehicles are depends on where in the world it is being plugged it. A car in China would likely be powered by coal-generated electricity while those in Norway would be greenest since the country uses primarily hydro projects. The U.S. is hooked to natural gas. A 2017 study showed that EVs overall contribute fewer emissions than a traditional gasoline car in much of America. The advantage biofuels have are tax breaks and regulations. Supported by these, ethanol and others represented almost 7 percent of the energy used for road transport in the U.S. and France last year, while electricity accounted for less than 0.5 percent, according to Delcourt, who co-founded Global Bioenergies in 2008. In crop-rich countries like France and the U.S., biofuels could account for a third of fuels burned by cars and truck by 2040, with fossil fuels and electricity equally splitting up the rest, he said. However, biofuels are costly and sustained lower crude oil prices may restrict a desire to blend them into the fuel mix, while EVs may depress demand over the long term, according to James Evans, an analyst at Bloomberg Intelligence. Still, biofuels "could be a useful transition fuel to shift towards a lower-carbon transport system," he said. Having built the demo plant in Germany last year, Delcourt and French sugar-maker Cristal Union are hoping to convince investors by the end of the year to build a 115 million-euro commercial plant in France. It would produce 50,000 tons of isobutene per year from 2021, enough to cover 1 percent of the country's gasoline consumption. "Producing a biofuel is always more expensive than making fossil gasoline," Delcourt said. "Biofuels are less taxed because they don't have the same polluting effects. Our goal is that consumers don't pay too much, and that the regulatory environment absorbs a large part of the extra cost."